When it came to our wedding day, photography/videography was one of the most important elements for us. We wanted something that directly reflected our love story and who we are as a couple. Photographs that somehow made our memories/feelings come back to life, regardless of how much time has passed. Those are pretty high expectations if you ask me, but Kiara and David exceeded all of them. From the engagement session, our elopement, to the wedding day, Kiara made us feel confident, beautiful and most of all comfortable. She took her time, had a TON of patience, and went above and beyond while trying to get to know us and making sure she was reflecting 'us' in every photograph. Throughout the entire process she was prompt with responses and made sure we felt at ease prior to and during the wedding. Also, the turn around time was outstanding from when the pictures were captured to when we received the full edited versions of them. I genuinely cannot say enough GOOD THINGS about Indwell Weddings. Between their kindness, their fun personalities, and their passion for not only the photography, but the couples who they capture; Kiara and David have an insane eye & ability to bring emotion to life within their work. I would recommend them to anyone, not just as a photographer, but a possible life long friend! Thank you Kiara & David for everything! We are so SO lucky to have had you as part of our day! My husband and I are in love with our wedding photos! We came from Sydney to elope in Las Vegas, and as none of our friends or family would be there we felt it was important to have some awesome photos that would capture our experience so it could still be shared with loved ones. I met Kiara a few years back for a photo shoot in Sydney. Since then she has been one of my favourite photographers to work with, and knowing that she specialises in wedding photography and resides in the States, it seemed like a no brainer to contact her straight away. The whole experience with Kiara was amazing; from organising during the lead up to the wedding, to the actual wedding day and then receiving the photos so soon after. Kiara and David made us feel super comfortable and as a result the photos turned out very organic and natural. They also came with a whole lot of ideas for places to go for the day after shoot as they were very familiar with the area. We trusted them to know what would work best so it left us very little to worry about and organise. The photos turned out so beautiful and are exactly what we had hoped for. Kiara and David did an amazing job at capturing our personalities and quirky little interactions. Every time we run into someone we haven’t seen since the wedding they will comment about how awesome the wedding photos are and how it looked like so much fun. We couldn’t have asked for better photos that we’d be able to keep forever and will continue to look back on until our old age. Thank you so so much! When my partner Konnor and I planned our trip to Oregon this fall, one thing that was really important to me was to get some professional photos taken of us to remember the experience. I went out on a whim and contacted Kiara, not knowing what to expect, and what I got in return was a genuine, friendly response. I knew immediately that she was the right pick. In the months up until the trip, Kiara continued to be in touch whenever I had questions or needed suggestions. When our original plan for location didn't go through, Kiara immediately had alternate suggestions and ideas, taking the stress and disappointment away from the ordeal. When shooting with Kiara, we were so relaxed and comfortable, and felt totally able to act like our normal, silly selves in love-- and in fact, that was encouraged. Kiara truly knew how to interact with us in order to capture the true essence of our relationship. To be honest, we both got pretty emotional viewing our gallery; not only did we have beautiful photos from a dream vacation, but we were able to see the way we looked at each other and how happy we looked together. I have nothing but an outpouring of gratitude and love for Kiara for the perfect photos we ended up with. I cannot wait to hopefully work with her again in the future. When planning our wedding, we agreed that photography was one of the few aspects of the wedding that was very important to us as this is the aspect that lasts a lifetime (other than our marriage, of course). We are a couple that enjoys sentiment and the joy of a moment, so choosing a photographer like Kiara was the perfect decision. Kiara is a photographer that captures precious moments, rather than manufacture them. We love our wedding photos because we can link each photo with the emotion, thought, memory and the purpose of the day as many of the photos are candid shots that perfectly reflect us as a couple. As a photographer, Kiara is very easy going. She not only ensured that the bridal party felt as comfortable as possible, but that we all had a good time during our shoot. She can turn a simple area into the perfect place that would match our attire, our wedding theme and our relationship. Kiara is incredibly skilled at what she does, and we would recommend her for any occasion. I have had the pleasure of encountering Kiara and David in almost every photographic context imaginable, from watching them operate as photographers at a family members’ wedding, participating in a creative workshop led by the duo, working with them on editorials and creative shoots, as well as a couple shoot with myself and my boyfriend, there is nothing they cannot do! I have gotten to know these two creatives over the years, and have seen first hand their professional attitude and approach to work, and the outstanding quality of their finished products. Both Kiara and David have a unique and well established style that speaks strongly of their confidence and expertise behind the camera. On top of this, they are two of the most kind-hearted, caring and considerate people I have ever worked with. I can say with the upmost confidence that I not only recommend Indwell Weddings for any of your photographic needs, but that you will also be delighted by the photographic experience and the beautiful pictures you receive. At the start of our photographer search I was fairly indifferent to getting our photos taken for our wedding. I knew it was an important part of the day and being able to have keepsakes of the wonderful event is important, but I'm not terribly photogenic and am really uncomfortable being photographed (think Chandler from Friends). After speaking with at least ten photographers we found Indwell weddings and Kiara. Our first interaction was via email and she was incredibly kind and accommodating. To help us get our sea legs and to meet her in person we arranged an outdoor engagement photo shoot. The day we selected ended up having miserable weather with an ice/snow storm the day before. Our original outdoor location was closed due to unsafe conditions and we thought we would have to cancel, but Kiara scoped out a backup location and we decided to get together. Despite the rain/sleet/ice and freezing temperature, the shoot went on and we honestly had so much fun. I'm honestly still surprised by how comfortable and easy it was to take photos with Kiara. Literally a day later we got to see the results and they were amazing. Somehow Kiara managed to capture our joy in being together and I'm truly grateful! As a couple we don't have many photos together so it's really special to now have so many that I love. I can't wait for our wedding and I can't wait to see what Kiara captures on the big day! Kiara’s photos encapsulated every aspect of our wedding day perfectly. She was professional and knew exactly what we wanted without us even having to tell her. Instead of merely documenting the occasion, Kiara was creative in her approach and captured the overall mood and atmosphere of the day in her work. Looking back at the photos, it seemed as though she was everywhere at once, capturing candid moments without us even noticing her presence. She was unintrusive and made us feel comfortable in front of the camera. Kiara went above and beyond in her preparation, emailing us back and forth with suggestions and meeting up with us before our big day to scope out the venue. She had a clear vision of the style we wanted and she helped us achieve this through her intuitive editing skills. She was fast to give us teaser shots and the rest of the photos followed very soon after. Kiara’s photos are stunning and every time we show them to friends and family, they cant stop gushing over them. Many long nights were spent painstakingly planning for the wedding, but the day itself flew by in an instant. We knew this would be the case, so choosing a good photographer that could capture every moment was important to us. Photos last a lifetime, so it is important to invest in someone that you can trust. We could not be happier with Kiara’s photos and we highly recommend her for any occasion. Kiara and David are amazing! They photographed our wedding a couple of months ago, and we are absolutely stunned with how beautiful and dreamy these pictures turned out. They made us feel so comfortable that we sometimes even forgot the cameras were there. They were attentive and accommodating to our every need. They ran around with us as the rain kept coming and going throughout the day, and captured the most amazing rain/shine pictures. They were prepared too, covering us with umbrellas and escorting us to their car to drive us to different locations so we wouldn't get too wet. Kiara even helped me with my dress, retying the corset back and putting safety pins under my dress when some of the ruffles started to unstitch. Could not imagine a better, more down-to-earth, joyful pair of people to photograph our special day. THANK YOU! David and Kiara of Indwell weddings flew all the way to the Upstate New York city of Syracuse to shoot out wedding and we are very glad that they did. We were very impressed with the quality of the photographs they took. So, it turns out, was our florist, who looks at more wedding pictures than we do, so don't take it from us, take it from him. A major contributing factor in the quality of the pictures was the experience of taking them with David and Kiara. Instead of feeling staged, forced, or contrived, as I was afraid a wedding photo shoot might, it was lovely to spend time with them as they authentically shared in our joy. I was also pleased that they had a sense of the gravity of the occasion. A wedding is not simply a party, it is a solemn promise of enduring love surpassed in depth only by the love of God. David and Kiara understood this and so they were able to capture not just our wedding but our love. They are serious artists and I highly recommend them to anyone who wants art to remind them not only of the events but of the meaning and purpose of their wedding. Let me start off by saying my husband and I LOVE Kiara, her Husband David & INDWELL Weddings! 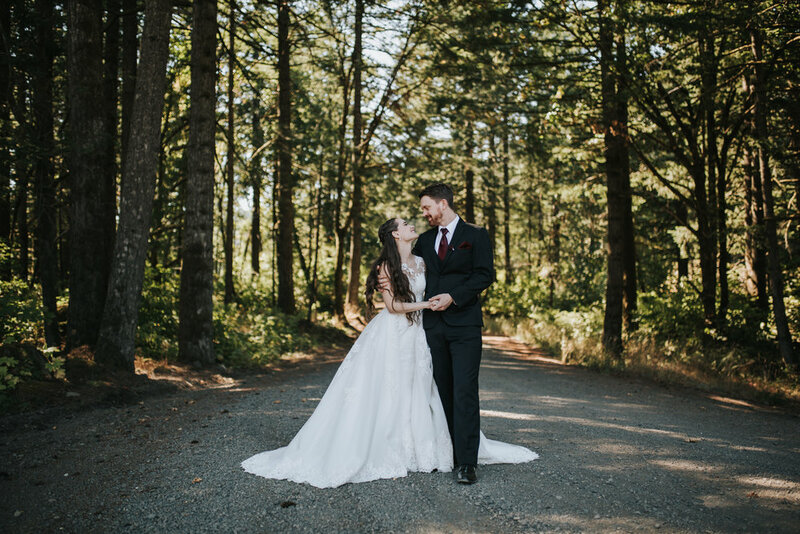 We all met up at Rowena Crest for our shoot and man oh man what a lovely experience it was! Kiara is endlessly talented, and the images she captured were stunning. I can not recommend Indwell Weddings enough! Just trust me on this, their work truly speaks for itself. I can’t wait to work with Indwell again! Hiring Indwell Weddings to take our wedding photos was one of the best decisions we made -- we still talk about how lucky we were to find them! Kiara was more than our wedding photographer -- she became our friend and someone I could go to with questions about anything wedding. My husband and I had never been in front of a camera before and she made us feel so comfortable and really was able to capture us as a couple naturally. She goes above and beyond for her clients and her passion for photography and sentimental nature showed in our interactions and in our photos. If you're looking for an intimate, personable, and beautiful wedding photography experience, I would 15/10 recommend Indwell Weddings. Kiara and David did a great job shooting our wedding last June. The photos that they captured for us included your expected stills and portraits, but also intimate moments, spontaneous laughter, and beautiful shots. Their care for their clients is palpable, and we're so thankful they were able to capture our big day! Kiara at Indwell Weddings, is beyond amazing. We had an incredible time during this casual photoshoot during our vacation and I am in absolute love with how it turned out! Plus, so happy we got to meet both Kiara and David!